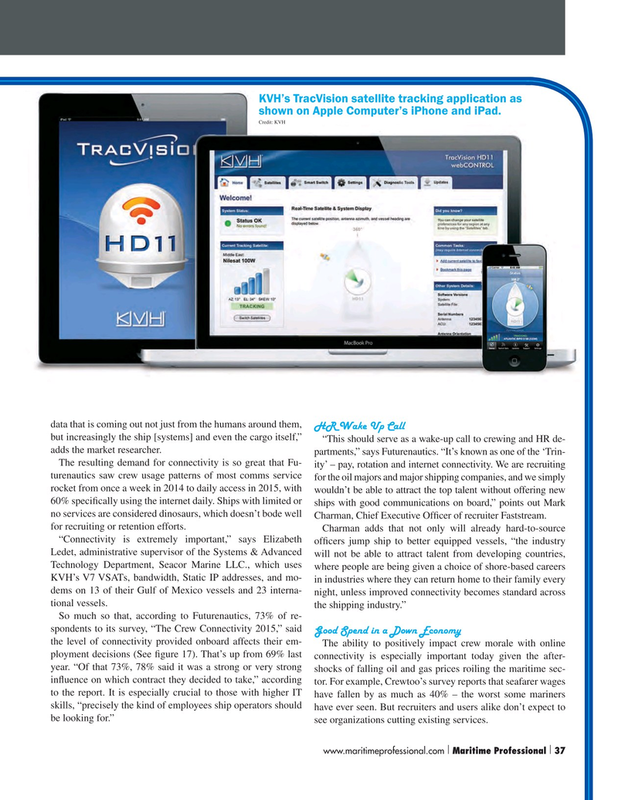 KVH’s TracVision satellite tracking application as shown on Apple Computer’s iPhone and iPad. Charman, Chief Executive Of? cer of recruiter Faststream. for recruiting or retention efforts. The ability to positively impact crew morale with online ployment decisions (See ? gure 17). That’s up from 69% last connectivity is especially important today given the after- year. “Of that 73%, 78% said it was a strong or very strong shocks of falling oil and gas prices roiling the maritime sec- in? uence on which contract they decided to take,” according tor. For example, Crewtoo’s survey reports that seafarer wages to the report. It is especially crucial to those with higher IT have fallen by as much as 40% – the worst some mariners skills, “precisely the kind of employees ship operators should have ever seen. But recruiters and users alike don’t expect to be looking for.” see organizations cutting existing services.